The electron is a fundamental subatomic particle, which carries a negative electric charge. Electrons generate an electric field. In organized motion they constitute electric current and generate a magnetic field. Electric current over time is a form of energy (electricity) that may be harnessed as a practical means to perform work. Electrons are found within atoms and surround the nucleus of protons and neutrons in a particular electron configuration. It is the electonic configuration of atoms that determines an element’s physical and chemical properties. The exchange or sharing of electrons constitute chemical bonds, and they are thus important in demonstrating the relational nature of physical existence. The word electron was coined in 1894 and is derived from the term “electric,” whose ultimate origin is the Greek word 'ηλεκτρον, meaning amber. The electron is one of a class of subatomic particles called leptons which are believed to be fundamental particles. As an elementary particle it is not considered to have any substructure (at least, experiments have not found any so far) and there is good reason to believe that there is not any. Hence, it is usually described as point-like, i.e. with no spatial extension. However, if one gets very near an electron, one notices that its properties (charge and mass) seem to change. This is an effect common to all elementary particles: the particle influences the vacuum fluctuations in its vicinity, so that the properties one observes from far away are the sum of the bare properties and the vacuum effects. The antimatter counterpart of the electron is its antiparticle, the positron. Charged particles, monatomic ions and larger particles, arise from an imbalance in the total number of electrons and protons in the particle. When there is an excess of electrons, the object is said to be negatively charged. When there are fewer electrons than protons, the object is said to be positively charged. When the number of electrons and the number of protons are equal, the object is said to be electrically neutral. A macroscopic body can acquire charge through rubbing, i.e. the phenomena of triboelectricity. Electrons have a negative electric charge of −1.6 × 10−19 coulombs (this is usually just stated as a charge of −1) and a mass of about 9.11 × 10−31 kilograms (0.51 MeV/c2), which is approximately 1⁄1836 of the mass of the proton. These are commonly represented as e−. The electron has spin ½, which implies it is a fermion, i.e., it follows the Fermi-Dirac statistics. While most electrons are found in atoms, others move independently in matter, or together as an electron beam in a vacuum. In some superconductors, electrons move in Cooper pairs, in which their motion is coupled to nearby matter via lattice vibrations called phonons. When electrons move, free of the nuclei of atoms, and there is a net flow of charge, this flow is called electricity, or an electric current. There is also a physical constant called the classical electron radius, with a value of 2.8179 × 10−15 meters. Note that this is the radius that one could infer from its charge if the physics were only described by the classical theory of electrodynamics and there were no quantum mechanics (hence, it is an outdated concept that nevertheless sometimes still proves useful in calculations). As applied to electrons the word "particle" is somewhat misleading. This is because electrons can also behave like a wave; that is they exhibit wave-particle duality. 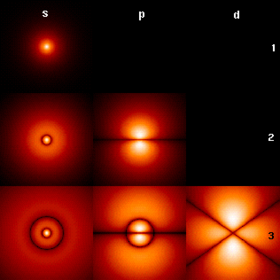 The wave behavior of electrons can be demonstrated in the interference patterns produced in a double-slit experiment, and is employed in the electron microscope. The wave nature of electrons is essential to the quantum mechanics of the electromagnetic interaction, where electrons are represented by wave functions. From the square of the wavefunction the electron density can be determined. Also, the exact momentum and position of an electron cannot be simultaneously determined. This is a limitation described by the Heisenberg uncertainty principle, which, in this instance, simply states that the more accurately we know a particle's position, the less accurately we can know its momentum and vice versa. In relativistic quantum mechanics, the electron is described by the Dirac Equation. Quantum electrodynamics (QED) models an electron as a charged particle surrounded a sea of interacting virtual particles, modifying the sea of virtual particles which makes up a vacuum. Treating the electron as a dimensionless point, however, gives calculations that produce infinite terms. In order to remove these infinities a practical (although mathematically dubious) method called renormalization was developed whereby infinite terms can be cancelled to produce finite predictions about the electron. The correction of just over 0.1 percent to the predicted value of the electron's gyromagnetic ratio from exactly 2 (as predicted by Dirac's single particle model), and it's extraordinarily precise agreement with the experimentally determined value is viewed as one of the pinnacles of modern physics. There are now indications that string theory and its descendants may provide a model of the electron and other fundamental particles where the infinities in calculations do not appear, because the electron is no longer seen as a dimensionless point. At present, string theory is very much a 'work in progress' and lacks predictions analogous to those made by QED that can be experimentally verified. In the Standard Model of particle physics there are three generations of matter particles. In this model the muon and the tauon correspond to the electron in the other two generations. Also in the model each fundamental particle has an antiparticle counterpart. The antiparticle of the electron is the positron (see below). Electrons are also a key element in electromagnetism, an approximate theory that is adequate for macroscopic systems, and for classical modeling of microscopic systems. The electron has a special place in the history of understanding matter. It was the first subatomic particle to be discovered and was important in the development of quantum mechanics. As a unit of charge in electrochemistry it was posited by G. Johnstone Stoney in 1874. In 1894, he also invented the word itself. The discovery that the electron was a subatomic particle was made in 1897 by J.J. Thomson at the Cavendish Laboratory at Cambridge University, while he was studying "cathode rays." Influenced by the work of James Clerk Maxwell, and the discovery of the X-ray, he deduced that cathode rays existed and were negatively charged "particles," which he called "corpuscles." He published his discovery in 1897. Thomson's work only allowed him to determine charge to mass ratio of the electron. It was Millikan's oil-drop experiment of 1909 that measured the charge on the electron and thus allowed calculation of its mass. The first quantum mechanical theories were explanations of the electronic stucture of atoms. In 1913 Neils Bohr proposed the first quantum mechanical explanation of electrons in atoms. In his model, electrons existed in quantized orbits around the atomic nucleus. Soon after this in 1916, Gilbert Newton Lewis and Irving Langmuir explained the chemical bonding of elements by electronic interactions. In 1925 Bohr's model of the atom was superseded by the wave description of electrons involving Schrodinger's wave equation, where electrons exist in orbitals. This model is still in use today. The electronic structure of atoms is the source of structure and periodicity found in the periodic table of elements. Brumfiel, G. “Can electrons do the splits?” Nature 433 (January 6, 2005): 11. The Discovery of the Electron – American Institute of Physics History Center. This page was last modified on 15 September 2017, at 19:26.